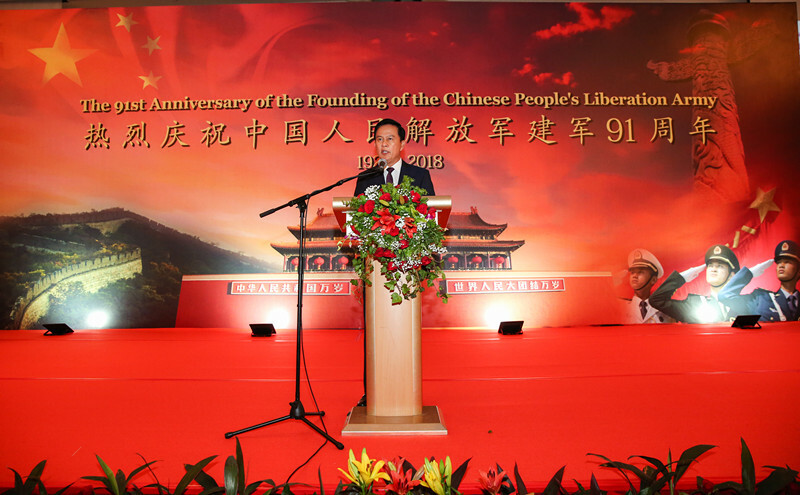 In celebration of the 91st anniversary of the founding of the Chinese People's Liberation Army (PLA), Senior Colonel Zhou, Army, Naval & Air Attaché of P.R.China in Indonesia, held a reception at Hotel Shangri-La, Jakarta on July 25, 2018. The reception was attended by Lieutenant General Hadiyan Sumintaatmadja, Secretary General of the Indonesian Ministry of Defence (MoD), Lieutenant General (Ret.) Sjafrie Sjamsoeddin, Vice-Chairman of the Indonesian Organizing Committee for Asian Games and Former Deputy Minister of MoD and Vice Admiral (Ret.) Desi Albert Mamahit, Former Special Staff to the Chief of Navy as guests of honor. 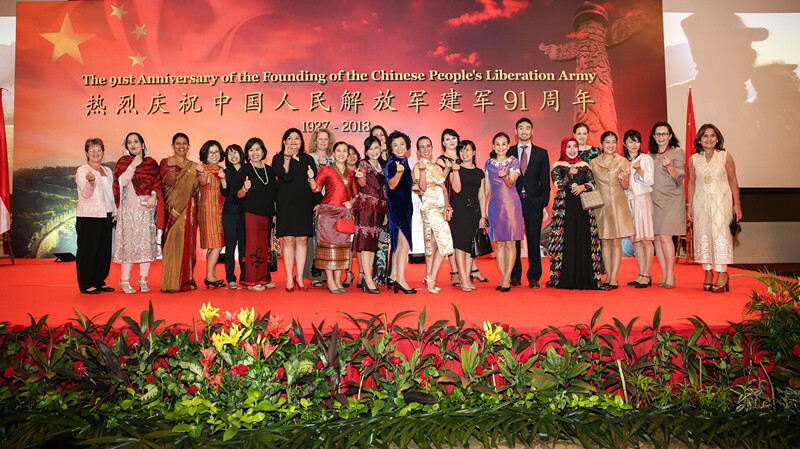 Around 500 guests including high-ranking TNI officers, senior officials, ambassadors and MILAT Corp members, politician and business celebrities, leaders of overseas Chinese communities, Chinese Chargé d'Affaires Sun Weide, Chinese Ambassador to ASEAN Huang Xilian, and other senior Chinese diplomats attended the reception. 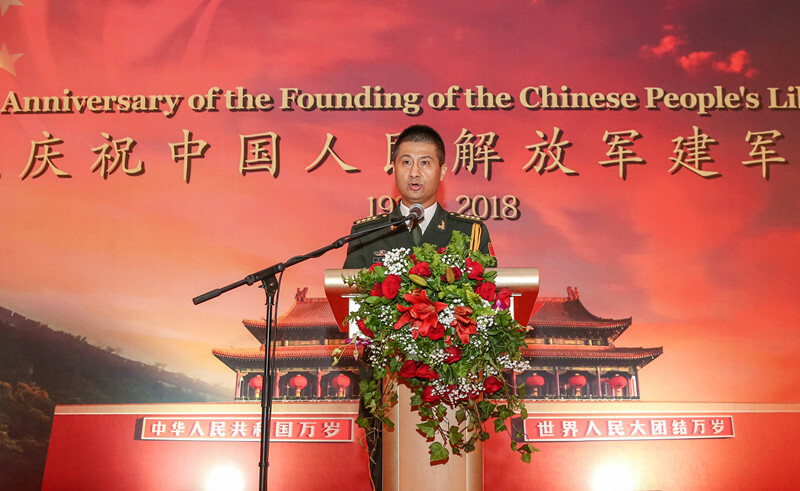 In the welcome speech, Senior Colonel Zhou Jian briefed on PLA’s significant contribution and development over the past 91 years. 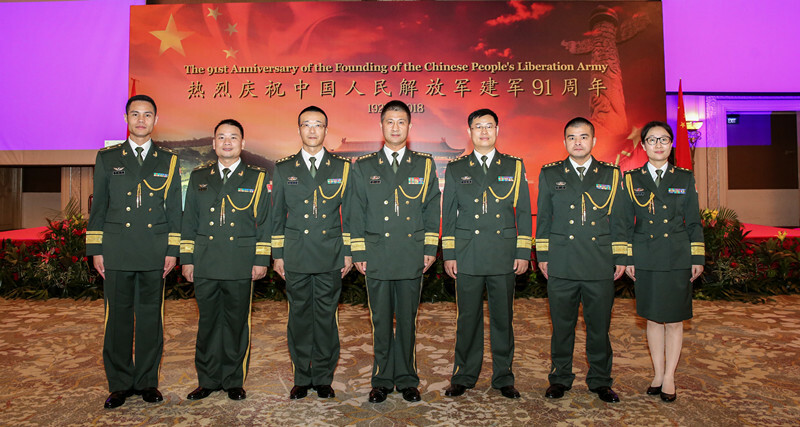 Since the 19th National Congress of the CPC, under the strong leadership of the Central Committee of the CPC, with Comrade Xi Jinping as its core, the PLA has placed greater focus on combat, encouraged innovation, built systems, increased efficacy and efficiency, and furthered military-civilian integration. We will spare no efforts to safeguard the Chinese dream of national rejuvenation. As remarked by Senior Colonel Zhou, the battle-hardened PLA is never afraid of war yet cherishes peace more than anything else. At the 19th National Congress of the Communist Party of China in 2017 and this year’s “two sessions”, President Xi Jinping reiterated China’s resolve in pursuing a path of peaceful development and the building of a community with shared future for mankind. China will always be a contributor to world peace, facilitator of global development and proponent of a just and reasonable international order. We stand ready to contribute China’s wisdom and efforts to lasting peace and prosperity of the world. In recent years, our armed forces have maintained frequent high-level exchanges and defense dialogues. We have further expanded cooperation in personnel training, equipment and technology as well as joint exercise and training. Such sound relations have reinvigorated our comprehensive strategic partnership. Looking forward, the PLA will remain committed to working together with TNI to further deepen and expand cooperation, and jointly develop a global security approach that features joint efforts, shared benefits and win-win results. 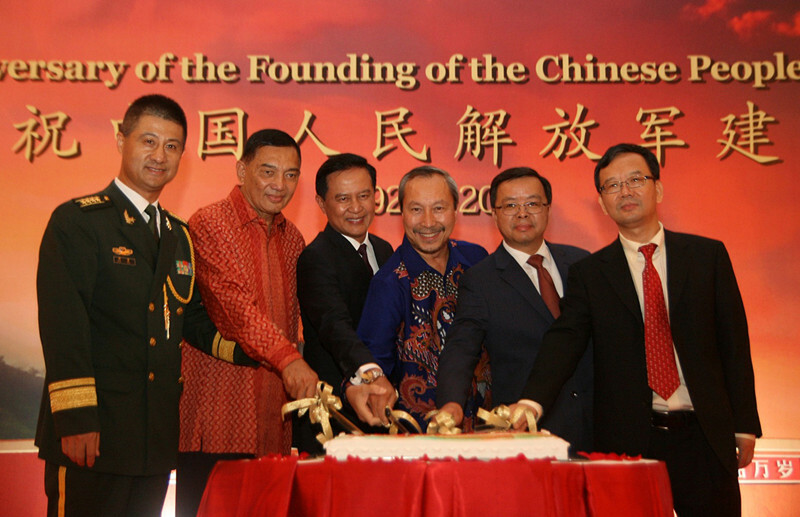 On behalf of the Indonesian Minister of Defense, Lieutenant General Hadiyan Sumintaatmadja congratulated on the 91st anniversary of the founding of PLA and remarked that as the China-Indonesia comprehensive strategic partnership continues to deepen, the two armed forces have achieved fruitful results in defense cooperation, military exchanges, and national defense industry. The two sides hope to further strengthen the partnership in future and jointly safeguard regional stability and global security for the benefit of all peoples. 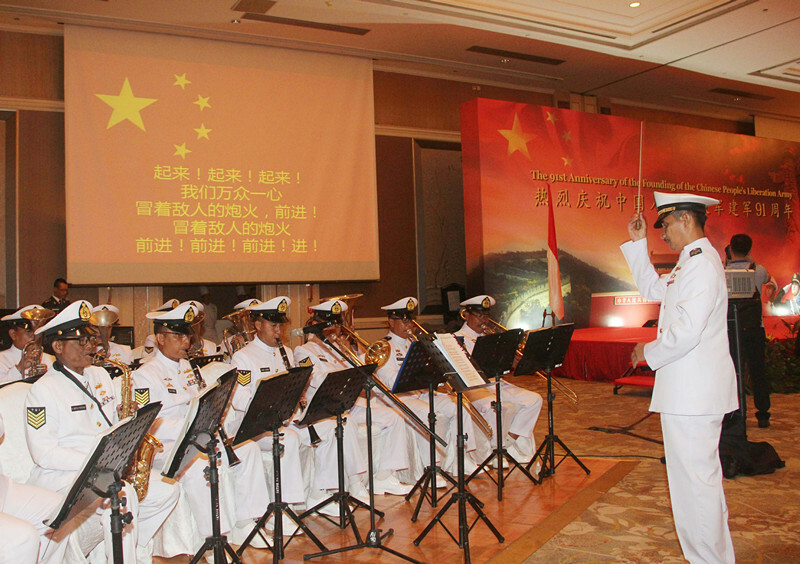 During the reception, attending guests also enjoyed a photo exhibition entitled “Snapshots of the Chinese PLA in the New Era”, a new documentary “The People's Army Entering a New Era” and a special music performance by the Indonesian Naval Band. 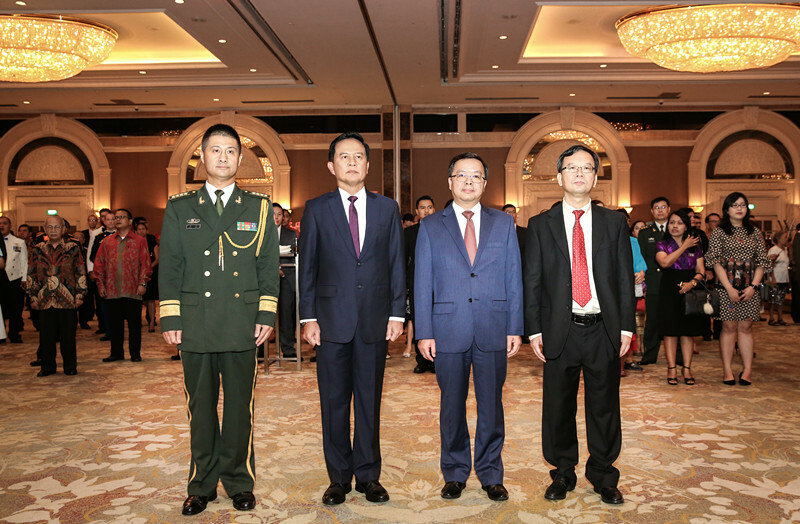 Guests expressed their admiration for the progress in China’s modernization drive of its national defense and armed forces as well as China’s contribution to UN peacekeeping, international disaster relief, anti-terrorism, commercial vessel protection etc. The reception lasted about two hours in a friendly atmosphere.